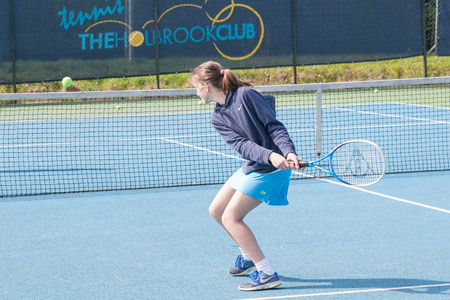 The Holbrook Club has three outdoor tennis courts available for hire throughout the week and an indoor sports hall that can also be used for tennis. The tennis section has a thriving number of enthusiastic adult, juniors and mini tennis players. We run adult leagues and events within the Club, competitive junior tournaments and LTA events. During the school breaks we also offer tennis camps to cater for all juniors, and summer 3-day courses for the adults with video-analysis. The adult tennis section at The Holbrook Club is an enthusiastic group playing Friday evenings (indoors during the winter) and Sunday mornings at 11:00am throughout the year. In addition to the twice weekly social sessions we run monthly tournaments and a number of box leagues. We cater for all abilities and new players are very welcome. For further information on junior tennis please visit our Children’s Tennis Page.